Birmingham born, London raised Harlea made quite the entrance last year with her debut tracks Miss Me and You Don’t Get It. High praise for these tracks came from NME, the Guardian and BBC Radio 1. We have three signed copies of the latest single from this up and coming star. Be in to win your signed copy of Harlea’s newest track Beautiful Mess. 2 – The competition closes on Saturday 1st December at 10.30am and a winner will be picked at random and announced on the Saturday Breakfast Show after this time. 3 – No cash alternative is available. The prize is for a ONE of THREE SIGNED CDs by the artist HARLEA. 4 – For any questions please email competition@surreyhillsradio.co.uk and title your email ‘Harlea CD Query’ for further information. Our friends from Ashtead have generously given us MORE family tickets to this year’s panto performance of Hansel & Gretel this time for the Friday night performance. The production has been written and directed by Lissea Jorden for your festive pleasure. Answer our quick question to be in for a chance to win these tickets. Our friends from Ashtead have generously given us family tickets to this year’s panto performance of Hansel & Gretel. Congratulations to Brittany and Bekki! You both win a family ticket each! This is lovely event taking place at the Hilton Hotel (Brighton), surrounded by fantastic people who are dedicated to caring and supporting others, and includes a lavish dinner for your nominated person and one guest, PLUS an overnight night stay for both, in a local 4 star hotel. This prize is being provided by Caremark Mid Surrey, based on Bridge Street, Leatherhead, who’s compassionate team provide care and support to both adults and children in their homes and the local community. In recognition of the wonderful work informal and unpaid carers do for their loved one’s, they would like to acknowledge that by providing a much deserved treat and night away for a deserving winner. If anybody needs further advice or support on any care matter, they can call Caremark Mid Surrey on 01372 230782, and speak to one of the friendly and understanding members of the team. The show features many new and exciting arrangements of all our favourite classic Broadway hits – with songs from Guys and Dolls, Les Mis, South Pacific, Wicked and many more, with an all star musical line up led by George Michael`s sax soloist, international sax star, Ed Barker. The Room are a melodic rock band from the Southeast of the UK and have featured on our very own dedicated prog radio show. After the band’s awesome live performance at The Robin 2 (near Birmingham) back in October 2016, they have released a DVD of the show. The guys have generously offered this as a competition prize along with a signed show flyer to one lucky winner. You could be enjoying the bold new stage production celebrating the iconic pop hero that was David Bowie….‘Live On Mars.’ The show will fuse together sound and vision to portray the essence of Bowie, his alter egos and creative muses, with elements of mime, dance, and stunning big screen visuals and animation. Derren Brown’s Ghost Train; Rise Of The Demon will be bigger, better and more scarier for 2017, with a new twist to the plot. The winners are invited to take a one way ticket on a horrifying journey into the chilling depths of the unknown. With intense live action and thrilling physical effects, the grasp of the Demon awaits. Andy & Nick from British progressive rock band IT have offered a signed copy of the new album as a competition prize! LP Creatives highly anticipated pantomime ‘Beauty and the Beast’ is coming to the Leatherhead Theatre this Christmas! Join them for an exciting adventure this year…an adventure that will transport you to the French village of ‘Marsh de Mello’, where a love story is waiting to unfold that will tickle your French Fancy! Children’s favourite CBeebies TV star Rebecca Keatley will make an appearance through the magic of pantomime, as she appears through the Magic Mirror at the Leatherhead Theatre. A special prog competition for you this December. Enter for your chance to win an LP or CD of the new Damian Wilson album ‘Built for Fighting’. Listen back to the live set from Damian Wilson on the 21st Century Prog show for a clue…. Damian came into SHCR to play his live acoustic set and was interviewed by Tom following the launch of his new album at Trading Boundaries. Your local amateur dramatics company and regular Sunday Morning Madness guests, the Woodfield Entertainers, are back on form this year with their panto performance of Alice in Wonderland. This year’s pantomime is directed by long time member Cara Turner with the addition of many new cast members. The story is a good old fashioned tale of good triumphing over evil. In addition to all the usual jokes and stage play, you can see our very own Simon Gadd in the cast. What role do you think he plays…!? Director Cara and cast member Neil joined Simon on the Sunday Morning Madness Show on 27th November 2016 to play the show’s usual games, promote the upcoming show AND do a live shout out to Simon’s mum! We have a wonderful family competition for your this December. Answer our simple question and you could be visiting Santa in his beautiful grotto in the Leatherhead Institute between the 17-24 December 2016. 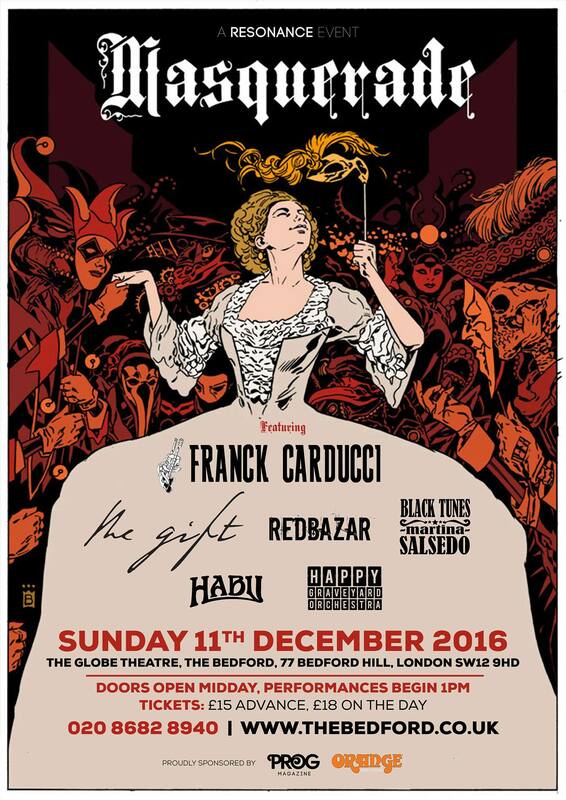 Two tickets are up for grabs for the Masquerade Festival, a one day rock festival featuring adventurous and dramatic acts. You and a friend will have a chance to meet the bands performing on the day. It will be a festive, extravert celebration, with a steampunk vibe. Guests are encouraged to come in masks and costumes! Rumours Of Fleetwood Mac, the world’s ultimate homage to Fleetwood Mac, returns to the stage Autumn 2016 for their landmark ‘Hits to Blues World Tour’ and you could be in the audience at the Guildford leg on their journey. Treat yourself to a haircut and home treatment pack with Claire’s Drivetime show sponsor Ward & Cross, Ashtead. Enter our draw to win a sporting day out with the family at the UK’s festival of sport, dance, health and fitness, GoFest. Congratulations to Paul, Emma, Sion, Frances, Mark, Barry, Scott, Janet, Kent and Jas! Treat yourself to a haircut with Claire’s Drivetime show sponsor Ward & Cross, Ashtead. The prize also includes 2x hair repair treatments, 2x conditioning wash and a candle. Caribbean restaurant Turtle Bay has officially opened in Staines! The popular chain eatery, well-known for its exotic cocktails, reggae music and spicy cuisine, held a special launch event on Tuesday (June 21) to raise money for the Teenage Cancer Trust. They raised over £2000! Congratulations Kunal, Frances, Katy, Katie and Lucy on winning Turtle Bay Vouchers! Battle Mountain is a moving documentary about the maverick Scottish cyclist Graeme Obree. Tempted back into competitive cycling at the age of 48 for a shot at the Human Powered Landspeed Record at Battle Mountain, Nevada, it’s a compelling story of an inspiring – and complex – sporting legend. Watch the film and then meet Graeme’s manager and Executive Producer, Charlie Milarvie for a Q&A Session with a pair of tickets from Guildford’s own indie community cinema. Congratulations Laurie on winning tickets to see Battle Mountain! Don’t forget Father’s Day is on 19 June 2016! Enter our competition to win a £50 bundle of health and beauty products for the daddy in your life including a £20 voucher for Ward&Cross Hairdressers in Ashtead, Surrey. Congratulations Louise Brown on winning our Father’s Day bundle! From 17th-18th September our festival will feature TV personalities and local food stars at its first outing at Sandown Park Racecourse, Esher. Stunning views across the racecourse and Surrey parkland and indoor and outdoor areas, make this the perfect venue for an all weather food and drink extravaganza. Congratulations Michelle Baillie on winning a day pass to the Fantastic British Food Festival!